As the summer draws to a close and the days get cooler, my runs tend to get longer and longer in anticipation of a few Fall marathons, or other longer races which depend on a full summer’s training. I have been wanting to knock off a big chunk of the Oak Ridge Trail for some time this summer, and I found some good running partners for this endeavor through a new Meetup, called “Middlebury Trail Enthusiasts“. For those of you are not familiar with this group of runners and trail seekers, it began just this summer. For the time being, most of the group runs have been in town, after work (5:45), leaving from the Marble Works on Tuesdays, and some Thursdays. While I have been a regular participant on these after work runs, which usually proceed at a pace amenable to conversation, this was the first time I had joined in one of the longer group runs. So, at 8 am on a beautiful Saturday morning, I joined up with Heather, the group founder, and John, the organizer of the local race, the “Moosalamoo Ultra” for a run up the ridge. 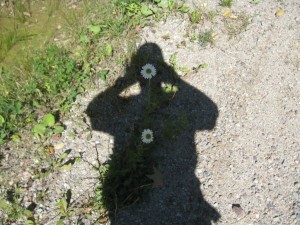 We started at the parking lot on Rt 125, between East Middlebury and Ripton, and headed up the trail. One sign of good conversation is that you miss trail signs, so I guess we got off to a good start by missing a well marked right turn, where the Oak Ridge Trail veered off of the Old Town Road, an abandoned road which serves as the northern terminus of the nearly 20 mile long Oak Ridge Trail. After about a quarter of a mile of running in increasingly higher grass, we realized our error, and backtracked to the incredibly obvious correct turn, and from this point we had no further routefinding difficulties! I had done this section of trail once before, as a point to point run, after being dropped off at a significantly higher altitude, the turnoff for the Voter Brook Overlook on the Goshen-Ripton Road. Running the same trail in the opposite direction added an additional 500 ft or so of climbing! The trail angles up the north side of Mount Moosalamoo, rarely becoming steep, over the course of over 6 miles. At one point, pretty high up, I grabbed a shot of my running partners as they attempted to escape me. Shortly after this point, I parted company with my running friends, as they were looking for a longer run than I today – they continued along the ridge toward the now near Moosalamoo summit, and I chose to descend on the Moosalamoo Trail to the Moosalamoo Campground, and return to my car by country roads. The descent was much easier than the ascent to this point – the Moosalamoo Trail gets much heavier foot travel than the longer Oak Ridge Trail. Some recent local new articles had alluded to trail maintenance on this trails, to make them more accessible to mountain bikers as well, but other than a few cut up trees which had fallen over the trail, it looked like this plan was not fully underway yet! I reached to Moosalamoo Campground, at around mile 9 in the run, and was surprised to see that, even on Labor Day weekend, this primitive campground only had two groups of campers staked out for the last holiday of summer. At this point, I knew my return would be by road, but the Goshen-Ripton Road is about as quiet as a road can get- in my 4 miles or so on this road, returning to 125, I saw only 3 cars. I also made mental notes of other trailheads to be explored in future postings, most notably the Wilkinson Trails across the road and to the west of the Widow’s Clearing parking lot. In one sunny section, I also noted some of the last daisies of summer, clinging to the side of the road. 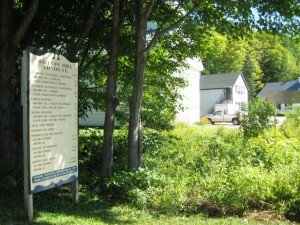 Rejoining Rt 125, I passed through Ripton, and realized that while I had passed through the village countless times by car, and by bicycle, the only time I had actually been on foot in the village was racing in the Ripton Ridge Run back in the 80s when it started and finished at the old Ripton School! I also took a moment to enjoy the whimsy of the reproduction of the old sign for road tolls on this route, posted in the yard of the Chipman Inn. Do you think they accepted Easy Pass? 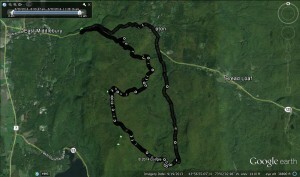 The last mile of the run was the most unnerving – the run through the twisty turny section of 125 below Ripton. The shoulders here were less than ample, and I took care not to run on the side of the road on the inside of the many blind corners where cars tended to cut it a little close! I did indeed survive this short section without a scratch, to return to my car in time to get home for lunch. Overall, this was a pretty long run for me, covering almost 16 miles, with about 1500 ft of climbing on the trail sections. 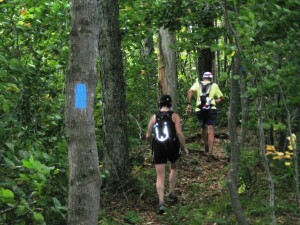 Finally – it would be great to see some new faces at Middlebury Trail Enthusiast events – check it out! I’ve run part of the Oak Ridge trail but didn’t realize it connected to Mt. Moosalamoo! I also didn’t realize that when running up Moosalamoo from the other side. 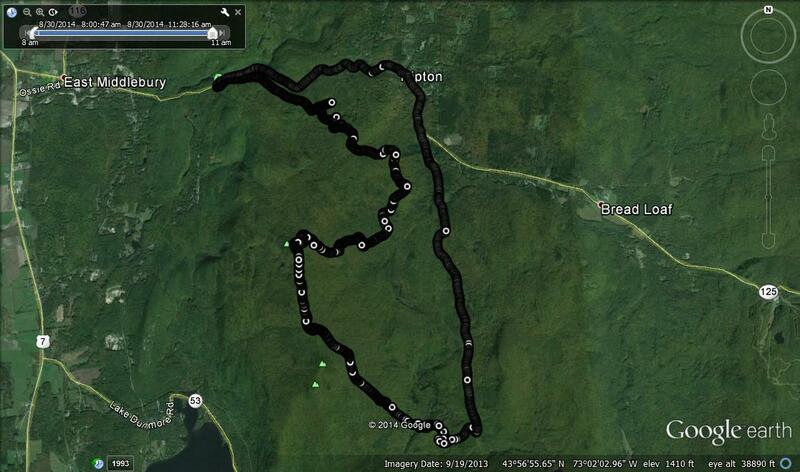 Will have to figure out the back roads to loop around to Ripton. I did just run those S-curves thru Ripton last week and compared to going out from Middlebury, going back toward Middlebury through those super tight turns was pretty damn hairy even though I was wearing a screaming yellow T-shirt I don’t think a driver could easily see me if he was speeding thru the turns. I’m surprised I haven’t run into you on the trails ever! I mostly run in the late afternoon/evening though, I don’t do mornings unless I’m on second shift. When running through the S-curves I always move to the outer lane so there are no surprises on the tight inside corners. If you run evenings, you should join in with the Tuesday night trailrunning group that does an hour or so on the TAM every Tuesday night at 6. That sounds fun! Do you still meet at Marbleworks? I actually ran Oak Ridge over Moosalamoo yesterday and then took the North Branch trail to the Falls of Lana and came out by Branbury and took Lower Plains Road. According to GPS it was about 32 mile round trip from my house. I also almost ran into a porcupine on the way down Moosalamoo! The ridge is beautiful and there’s lots of spring flowers right now but TONS of trees and branches across the trail so along with running there was dodging, bushwacking and scrambling. The Marbleworks at 6:00 – We meet by the parking lot lawn near Noonies. The gang is hard to miss.